We proceed with the series of articles about the thrones of the great rulers. We tell about the history of the Gugong Palace throne. 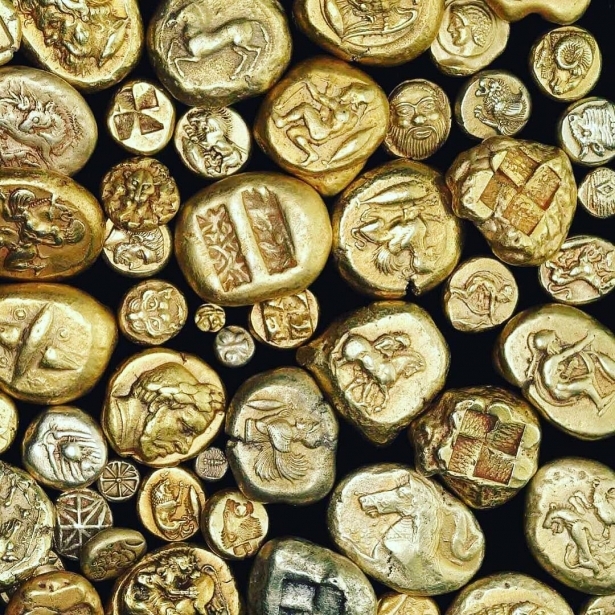 Since ancient times, people believed in the magical power of gold. This noble metal embodies royalty and wealth. 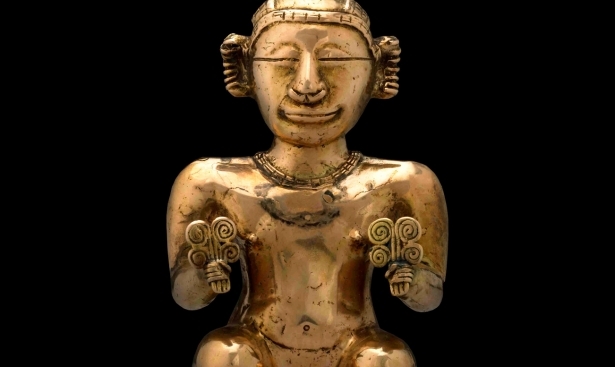 Rulers and emperors often ordered for themselves golden ceremonial chairs - symbols of power and greatness. The grander the throne looked, the more powerful the monarch appeared. We have already told about the golden throne of the Egyptian pharaoh Tutankhamun. The second story is devoted to the Dragon Throne - the throne of the rulers of the Celestial Empire. The Forbidden City (or Gugong) in Beijing is the residence of the emperors of the Celestial Empire. This is the largest palace complex in the world, the area of which is 72 hectares. 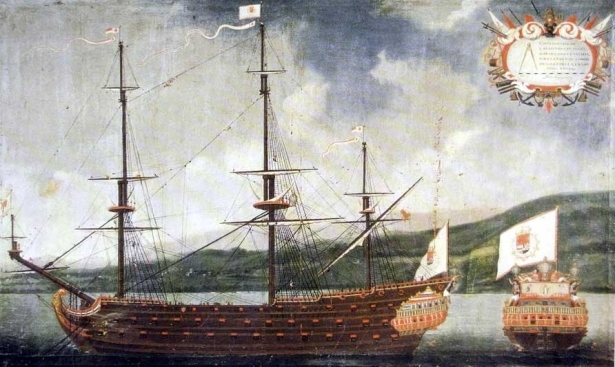 The Emperors of the Celestial Empire were considered to be the Sons of Heaven on Earth and were regarded by people as deities. In Chinese philosophy, the yellow dragon is a heavenly messenger, a noble and wise man. The emperor himself was also referred to as the "dragon", and his ceremonial chair - "The Dragon Throne" or "The Dragon's Place". 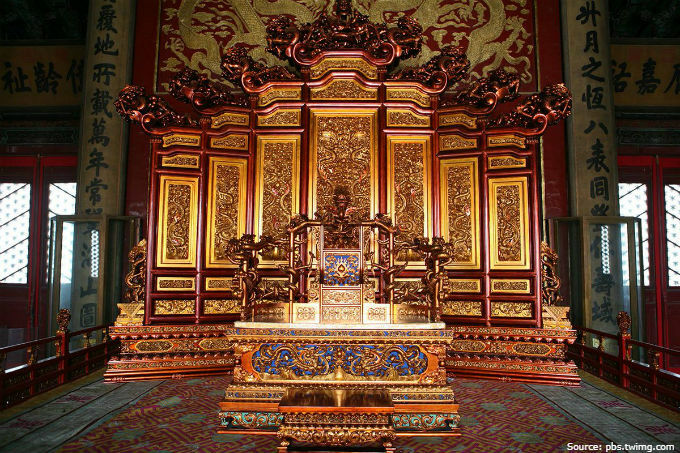 A large golden throne is the main symbol of the power of the emperors of China. The imperial armchair is decorated with an elaborate carving with images of wriggling dragons and a generous scattering of precious stones. 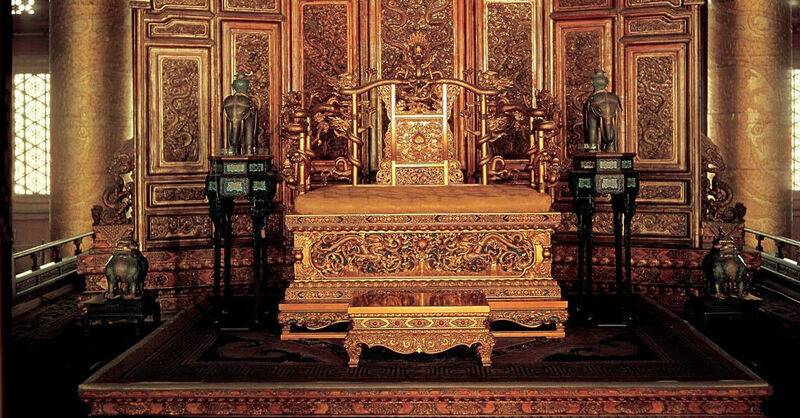 There are inscriptions around the throne that were made during the reign of the Qing dynasty. The essence of the message is that "if you make a clear and universal action plan and follow it, you can rule the country well." These wise words are the motto of the reigning emperors of China. In 1915, dictator Yuan Shikai proclaimed himself Emperor, wishing to reign on the "dragon" throne. The "coronation" ceremony was held in the Throne Room of the Forbidden City. It turned out that Yuan Shikai had very short legs and the imperial throne did not suit him in height. Short in stature dictator was offended and ordered himself a new throne - a chair with a high back, and the golden throne of the emperors of the Celestial Empire was deemed unnecessary. Chinese scientists were searching for the precious throne with carved dragons for several decades and found it only in 1959. In 1963, Chinese masters restored the throne. Currently, the imperial throne can be seen in the Palace of Gugong. In the next article, we will talk about the golden throne of the emperors of the Great Mughal dynasty.